Looking at my family tree the other day I remembered that I had a gap for my grandfather’s brother. My grandfather (Clifton Winnington Grannum) died in the Second World War and over the past 40 years or so the family had lost contact with his brothers and sisters. They had met his sisters (Dorothy) Edmee and (Joyce) Yvonne and their children but I don’t think that they had met his brother. In fact they were uncertain about his name and so on my family tree I had written Robert Anthony Grannum (he was known as Tony). I wrote ‘Robert’ in my wiki article about my great-grandfather Reginald Clifton Grannum and an MGrannum in November 2010 amended it to Reginald. While I was researching my great-grandfather I noted that he had taken extended leave in 1911 and 1913 and assumed that this was due to the births of his two youngest children and that there were probably born in either British Guiana (where he was working and living) or Barbados (where his family lived). I subsequently met Yvonne’s daughter and she confirmed that her mother was born 13 November 1913 in British Guiana (now Guyana) but she wasn’t sure about Tony. The Church of Jesus Christ and the Latter-Day Saint’s London Family History Center has microfilm copies of the Barbadian birth and baptism registers for 1911. They are currently based in the National Archives and so one lunch time I thought I’d see if I could find Tony. If he wasn’t in the Barbados registers I would assume that he was born in British Guiana. Then by date of registration (not date of birth). I was surprised to see that most of the entries did not give a child’s name – if anything was entered in that column it was usually to record still-births or death of the child soon after birth. Most of the children were born to unmarried mothers and so the father’s column was usually left empty. So most entries only contain one name – that of the mother! The register is on 16mm microfilm which even on full magnification wasn’t easy to read but the arrangement and having an uncommon name made it easy to scan the columns. I only needed to focus looking at the minority of entries where the father was recorded and look for Reginald Clifton Grannum. I needed to confirm his name and so hoped that he had been baptised in Barbados. I didn’t know where he was likely to have been baptised but I knew that other family members had been baptised and married in St Michael’s Cathedral and St Leonard’s Church in St Michael. I assumed that they too would be Anglican. Even though I had a date to start from he could have been baptised weeks after he was born and so this was a slower exercise as I had to check every church and chapel. Again, the registers did not record the names of fathers of children born to unmarried mothers and so could focus on father again. I have now updated by family tree software: Reginald Anthony Grannum, born 22 June 1911, Christ Church, Barbados. 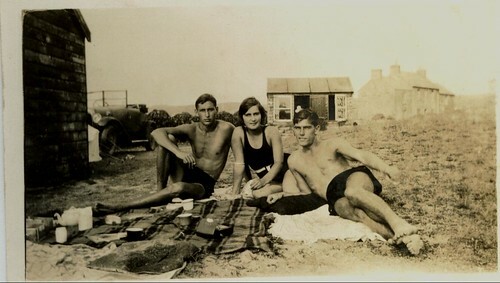 He later settled in South African and married Marion Elizabeth Catherine Morkell (nee Beyers) on 1 November 1939 in Johannesburg – their children still live in South Africa. I don’t know anything further about him. If any of his children or grandchildren read this please can you add a comment. Photograph is from my grandfather’s photo album (originals held by Guy Grannum). The birth registration and baptism images are taken from microfilm held by the Church of Jesus Christ and Latter-Day Saints: Registers of births, 1907-1912 (microfilm 1666966), Registers of baptisms, 1908-1912 (microfilm 1666985), from originals held by the Barbados Archives. This entry was posted in Biographies, Genealogical sources, Grannum research and tagged Barbados, Clifton Winnington Grannum (1906-1940), Joyce Yvonne Grannum, Photographs, Reginald Anthony Grannum. Bookmark the permalink. I don’t have anything about Athelbert in my data. If you can contact me via the contact form providing more information eg date and place of birth and anything about parentage and siblings and can see if I have anything on the wider family.